My mother in law is a massive fan of the original Ghost fragrance so I decided to try some more of their range. Here are my thoughts below. 1. Ghost – The Fragrance – This is the original Ghost fragrance, it is very subtle and not too overpowering. You can really smell the rose and vanilla. It would be a great fragrance to wear of an evening. 2. Calvin Klein – Eternity Night – This has a very floral scent to it but is very soft and would be a perfect summer fragrance. 3. Moschino – Stars – I am a massive fan of the Moschino bag and clothing line so was excited to try one of their scents. It is quite strong and smells almost orangey. This would be perfect for a night out. 4. Giorgio Armani – Si – This was very light and fruity, another great one that reminds me of summer. 5. Ghost – Enchanted Bloom – This was quite a strong fruity scent. it was hard to describe. I prefer the original Ghost to this but if you are looking for something stronger then try this one! 6. 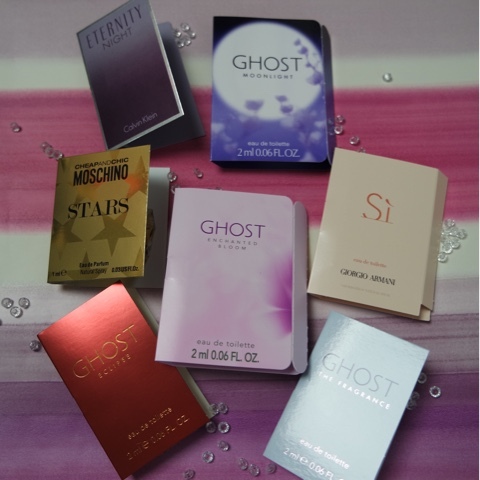 Ghost – Moonlight – This is a very sensual fragrance which would be great to wear of an evening or on a date. It is quite deep and musky. 7. Ghost – Eclipse – This is a nice fresh and fruity fragrance. You can smell a hint of lemon but at the same time it is slightly floral. Let me know your favourite or if you have tried any of these? Previous Article Thinking of buying new sunglasses?